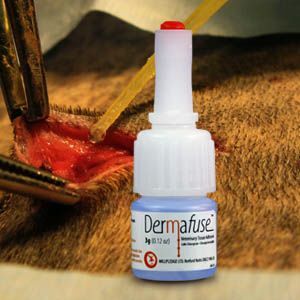 Dermafuse™ Tissue Adhesive is a medical adhesive used to bond tissue together following veterinary procedures (i.e. lacerations, abrasions, suture/staple line sealing, tooth extractions, oral surgeries, spaying/neutering and dewclaw removal). Product contains blue dye to allow user to easily see where product has been applied. On contact with body tissue, Dermafuse™ changes from liquid to solid state by polymerising within seconds to seal the wound. The Adhesive stops minor bleeding and binds wound edges. Each 3g bottle contains approximately 175 drops. Dermafuse™ Tissue Adhesive must be at room temperature before use. Do not heat. Unscrew bottle cap. Place flexible applicator tip on bottle - push to click in to place. Dermafuse™ Tissue Adhesive may be used between stainless steel staples, but application of adhesive on staples may interfere with staple removal. When finished, remove excess adhesive in vial tip by holding bottle upright and gently squeeze single drop of adhesive out of tip onto a paper towel. Wipe bottle tip with the same paper towel. Replace bottle cap. Expel adhesive from applicator tip by pushing air through it from a standard syringe. Clip hair from around site. Wash with anti-bacterial soap, rinse and dry thoroughly. Apply pre-operative Surgical Solutions such as povidone-iodine preparations, chlorhexidine or isopropyl alcohol. Allow the prep solution to completely dry prior to surgery. After the surgical procedure is complete, approximate the edges of the wound/surgical incision. Apply Dermafuse™ Tissue Adhesive sparingly to the surface of the site to form a thin layer. Thick applications will crack and lift prematurely. Avoid touching moist surfaces with applicator tip. Do Not apply Dermafuse™ Tissue Adhesive internally or below the epidermal layer. Prepare surgical site as usual and amputate claws using routine surgical procedure. Remove as much blood as possible from incision site by blotting. Approximate the edges of the wound/surgical site and sparingly apply Dermafuse™ tissue adhesive to cut surfaces of the skin using the plastic applicator tip provided, one drop for each digit should be sufficient. Caution: Do not allow Dermafuse™ Tissue Adhesive to drip into the cavity. Any residual tissue adhesive below the closure site can cause foreign body reactions. Do not glue hair into site. Hold the skin edges together for 5-10 seconds. After completing the procedure, check for bleeding and reapply a drop of adhesive to the skin edges if necessary. Bleeding will normally stop within 5-10 minutes. Sutures or dressings are usually not needed, but a pressure bandage may be applied if warranted. Avoid contact with skin and eyes. For use near eyes, place damp towel over eyes for protection. If on skin, wipe immediately with a paper towel. May be removed from skin with dimethylsulfoxide (DMS0) or a mild solvent such as acetone. If in eyes, hold eyelids open and flush thoroughly with water. An ophthalmologist should be consulted. Use in a well-ventilated area. Avoid breathing vapours over long periods of time. Avoid contact of adhesive with utensils, tools, gloves and surgical instruments. Polymerized adhesive on instruments can be removed by soaking in acetone. DO NOT USE if adhesive appears thicker than water at room temperature. Thickened product has partially polymerized and will not form an acceptable bond. DO NOT USE internally, on infected and/or deep puncture wounds, or beneath the epidermal layer. DO NOT USE in the presence of soaps, cotton products (gauze, cotton tipped applicators etc. ), basic substances (soaps etc.) or polyurethane foam applicators. These materials may cause excessive exothermic (heat generating) reaction. Product can be refrigerated or frozen to extend shelf life before opening. Store bottle upright on shelf in a cool, dry place away from heat. After opening, DO NOT RETURN BOTTLE TO REFRIGERATOR. Note: A white chalky substance may form on the outside of the bottle (bottle blooming), this is normal and does not compromise the effectiveness or the integrity of Dermafuse™ Tissue Adhesive.